27th Feb notes – 2014 Chapeltown Year of Culture? There have been plenty of ideas bubbling away and slowly maturing over the past year or so and the pool of interested people is growing. On Wed 27th Feb more new faces joined some familiar faces to discuss some of those ideas in greater detail. We outlined the idea of the ‘Made in Chapeltown’ branding project (click madeinchapeltowncomplete to see the logo ideas that Tom has come up with) and we discussed the idea of businesses paying to be included in a ‘Made in Chapeltown’ directory (online or in print) and buying materials like window-stickers, paper bags, labels, stamps, etc to fund the admin, development and promotion of the brand/idea. This doesn’t have anyone in particular taking it forward at the moment, but is slowly developing anyway with minimal pushing from Cath. Chapeltown Heritage Tour: Johanna is contacting the Civic Trust to get details of a Chapeltown tour they’ve previously done, which Larna thought was great. Either they could do it again (our easy option) or they could give us the info so that we can do it ourselves. Randolph H works as a tour guide in Nevis, so he was also interested in this project. Art(s) Trail: Sandra sees this as an artist-led or creative-led initiative: although funding for the admin side of it would be nice, it’s unlikely there’ll be funding for artists to contribute work. However, it is a show-case and sales opportunity. In other places, artists have paid to be included in the programme as it will drive their sales. Sandra will spend 3 months researching and working out the viability of it and looking for other creatives who want to be involved on a voluntary basis. She’ll report back either at another projects discussion in mid-May or at the May Chapeltown Conversation on 29th. 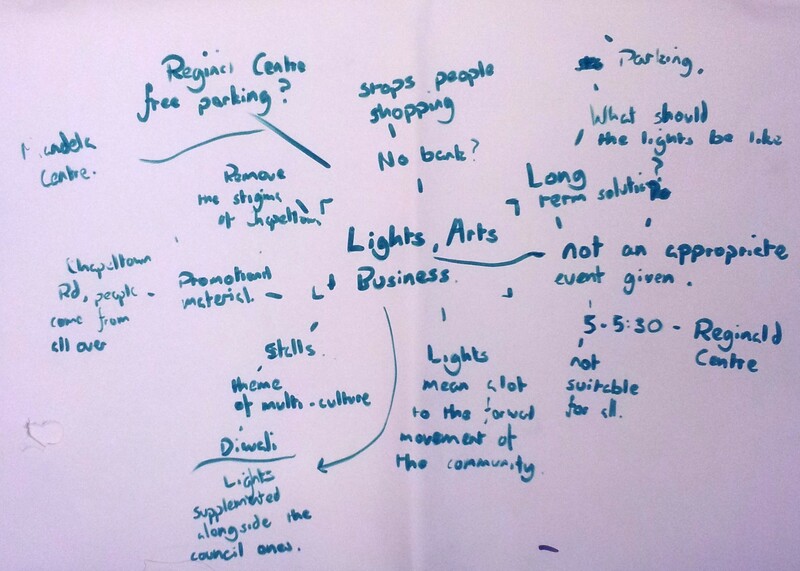 Festival of Lights: prompted by wanting to make the Chapeltown Christmas lights turn-on an exciting and creative event enjoyed across the community, previous conversations ran away with ideas and it became a several weeks long programme of events. The original idea came from Nattylyn, so if it’s something you’re interested in making happen, we can put you in touch with her. Food Festival: At the very first Conversation, Janet’s idea for a harvest-time food festival was very popular, but the group that started putting it together didn’t stay together to bring it off – we wondered if Janet and others would be interesting in revisiting the idea in 2014 if there were more people involved. Festival of Ideas for Chapeltown: 3-4 years ago, Leeds Met Uni design students had ‘Improving Chapeltown’ as the theme for their semester’s project and came up with a truly amazing range of ideas for good stuff. Although it wasn’t subsequently possible to get the ideas presented in Chapeltown, it would be great to see if it could be a project again in Autumn 2013. Cath to contact the lecturers who were involved last time to investigate the idea, perhaps in collaboration with a local school, church or other community venue. Larna took on investigating funding opportunities for the various projects or possibly for some overarching funding to draw together the whole programme. Garry will drum up interest to get more people involved. We’ll mention all this stuff briefly at the next Chapeltown Conversations on Saturday 23rd March, although it really needs its own meetings from now on. 2) A festival of lights next winter – which could be anything from one night to a few weeks, from Bonfire night through Diwali to the turning on of the Xmas lights and all the various light-related events in between. Chapeltown Conversations is delighted to host these discussions, and very hopeful that each idea will be brought to life by those who turn up. well – the new year ushers in a new vibe: we’ve run out of funding, so no more cash for venues & food until we get some more. We’ve got venues sorted for March (sikh temple) and may (Union 105) and we’re all happy to bring food to share, but we are stuck for where to put 20 people in a free self-catering space from 6-9pm on WED 23 JAN. Can you help out or think of any ideas? At the last Chapeltown Conversation on Sat 24th Nov, there was a bit of a buzz about an idea to create a 2-4 week cultural festival of light on Chapeltown Road, taking in Diwali, Bonfire Night and finishing with the switching on of the Christmas Lights. We already had a meeting booked for people helping to organise Conversations, so we decided to use that time also to look at making this Festival happen. Tomorrow – Thursday 6th Dec, 5.30pm at Cornerstone Housing Co-op on Sholebroke Avenue. If you want to bring a snack to share, please do. Effective communication and methods employed in order to attract more people to the Conversations. Agreement that nowadays effective communication is a mixture of online and word of mouth. Need to make better use of free social media resources e.g. Twitter and Facebook. These social media sites will allow people that are not present at the Conversations to contribute to the conversation if questions and issues are being posted online as they are being discussed. Potential promotional film could be made that will include vox pops and interviews. Use of quotes from people that are not comfortable with being filmed means their opinions will still be heard. This film would attract more people to attend the Conversations, as they will know what to expect and it will normalize the idea of coming to discuss these issues. Yasmine/Tom to see if their college mates are interested in doing this. 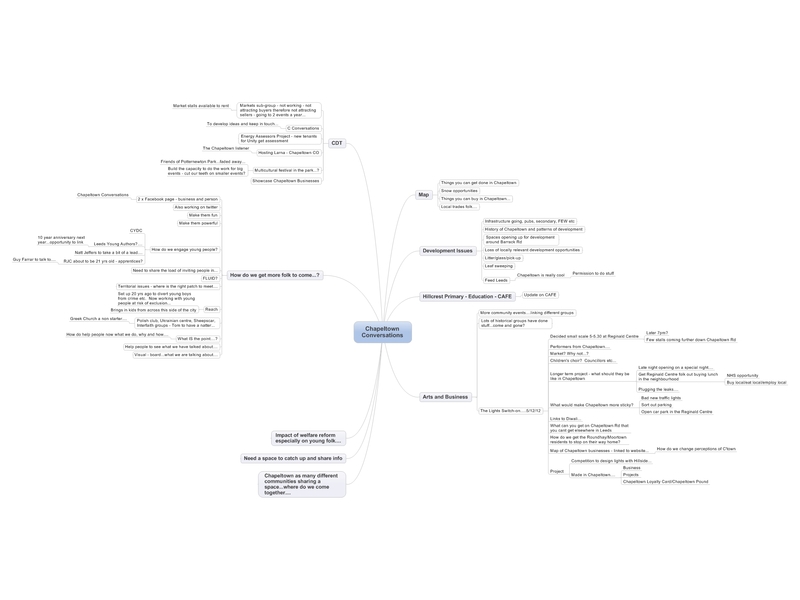 Create a mind map as well as record the minutes. Will make reading the notes from the Conversations easier to understand and more accessible. Chapeltown Conversations is not a bureaucratic organisation; therefore the way the meetings are recorded should reflect this. Youth vs. 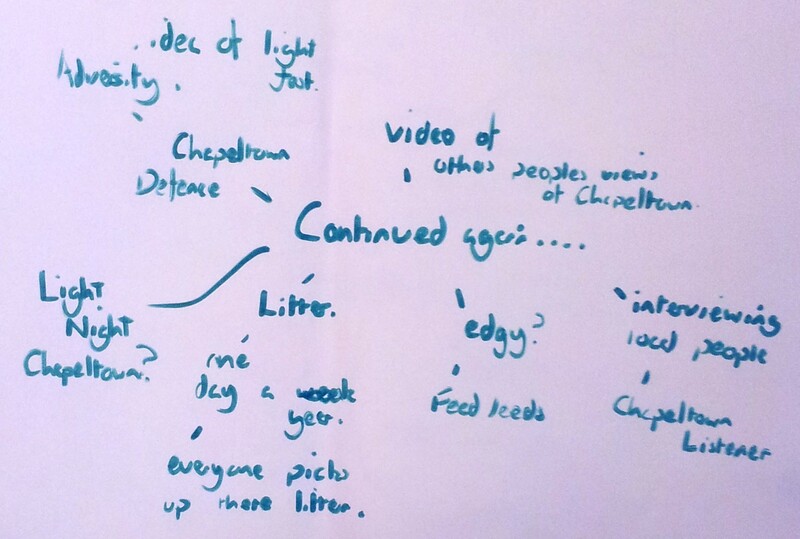 Adult led voice of Chapeltown Conversation, both online and in the ‘real world’. How to appeal to a younger audience, and get them involved. Potential idea of involving Leeds Young Authors. Discussion of Thomas Danby College to be knocked down. What will replace it? Will there be positive regeneration on the site? There is an issue of a lack of social centres being closed down (lack of pubs and secondary school, and now lack of Further Education). However, there are numerous specific community centres. Issue of how to retain connections between all the communities if all the ‘neutral’ social centres are closed down. What happened to PARK and CHART art organisations? What do people think about the changes in housing benefit funds? Idea rose of holding a multi-cultural festival in a park, or an event to promote the business’ in Chapeltown held in a neutral space to display their services. We agreed that the light switch on times were perhaps a little bit disappointing (17:00-17:30), however a discussion was formed out of this thought that it would be more conducive to focus on ways in which to improve the system of the Christmas lights for next year. It would be good to get the car park behind the Reginald Centre open for free parking out of hours. Buy Local, Eat Local campaign. Why has the Chapeltown Market not succeeded as a monthly thing? What could be done differently to make it work? Made in Chapeltown brand, for promoting (by) local businesses. Tom will work on the branding, and will bring along some design proposals for the meeting on 6th December. To view the map just click the image to open it, and then click again to zoom in and explore! Please leave any comments or questions in the comments box below and we will respond as soon as we can. 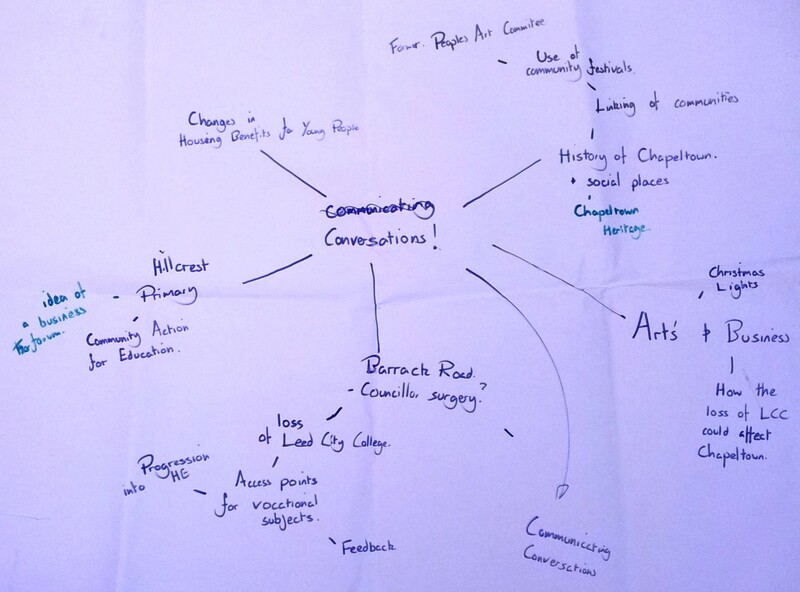 How can Chapeltown Conversations benefit more people? a brief discussion about how we tell people about when the sessions are and what we’re achieving. The September conversation at Roscoe Methodist Church hall saw some new faces joining those of us who are getting the hang of it all now, including Georgina and Rev. Mark from Roscoe and Larna, Chapeltown’s Community Organising trainee, http://www.facebook.com/TheChapeltownListener. Some themes are beginning to recur, which probably means they’re ripe for action and ideas were certainly flowing. 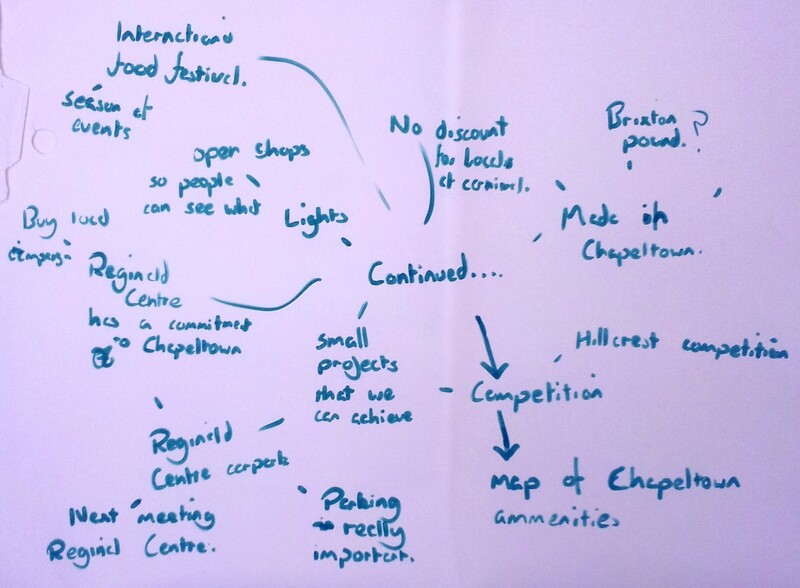 My notes just cover the discussion about supporting local business and some of a conversation about Chapeltown Development Trust. The two other conversations were about the local arts scene and about the co-housing group’s eco-village plans for Leopold Street (www.rosevilleleeds.org.uk) and they’ll be written up by Sandra & Ali/David. Norma from Orlondo’s came along to share her problems with an excess of stock. We talked about whether someone else could help her sell it (including via Ebay, or selling it by weight). This generated an idea for an event (eg before Christmas) where local businesses showcase their wares and Orlondos could fill half of the Roscoe hall with with clothes – this could tie up with the Development Trust’s own festive fair or market, so Cath will pass details on to the markets subgroup to see what they think. There was some discussion over whether helping Norma would be a good student project – eg for a fashion or marketing student. David works at one of the unis, so he could broker a meeting and Cath will ask Yvette who works at LMU. We talked about the way businesses which sell to different kinds of people market themselves in different ways – eg some use lots of social media and appeal to a set of people spread city-wide or regionally, while others have a very local market and are very unfamiliar with promotion via the internet. It could be beneficial for different businesses to promote each other to their different markets – neither needs to do anything different or more than they already do, just mention the other every now and then. For example, Garry has a print project which is producing headscarves which Norma will hem – he’ll tweet about Orlondo’s and Norma will mention his exhibitions to her customers in the shop. We talked about linking businesses together, for example having a ‘Chapeltown business directory’. Cath mentioned that CDT and Unity Enterprise are awaiting funding for a joint ‘Chapeltown Enterprise Network’ project, which would both create a network and also have a local small business advisor. We remembered the ‘I heart Chapeltown’ bags the Council produced a few years ago and came up with a ‘Made in Chapeltown’ brand, that all local producers could use (thought it might work really well for baby clothes!). Norma mentioned that what she really wants is someone else to handle the marketing and systems side of things, so that she can just get on with sewing. This generated another idea of the businesses all collectively employing someone who’s job would be to check in with them all, keep them networked with each other and help them with general business advice if they’re struggling with anything. Unfortunately I’ve lost my notes about what we said in this session, so here’s some stuff from memory. 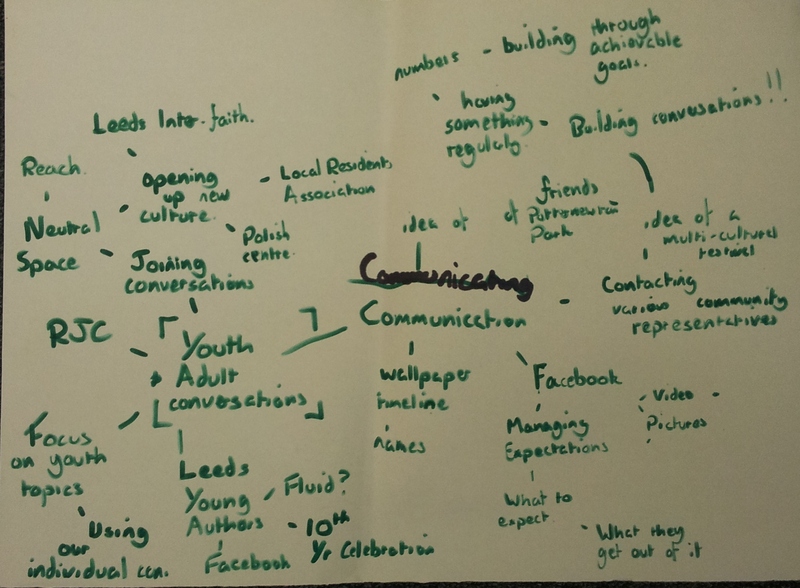 We talked about getting Conversations to be more linked up with Chapeltown Development Trust, what CDT is for and how it could generally be supported. We talked about how Conversations could continue now that the funding from the council’s Area committee and from Feel Good Factor is coming to an end – Bryan from East North East Homes seemed to think the ALMO should support Conversations and that it would be easy to get the money. And this is a classic example of why notes should always be written up straight away. Ho hum. The next Conversation is on Saturday 24th November, 3-6pm at Leeds Reach on Chapeltown Road.